Joon-Soo (Jang Keun-Suk) is a rebellious high school kid, popular with the girls, but an absolute nightmare for his parents and teachers. Joon-Soo soon drives his parents batty enough that they decide to up and leave their house. When Joon-Soo finds out that his parents are AWOL he does what any party animal would do, he calls his friends over for a house party. That afternoon, Joon-Soo prepares for the party by going to the grocery store and buying drinks & food . While at the grocery store, he briefly leaves his shopping cart unattended to check out the liquor selection. When he comes back to his shopping cart, he’s stunned to find a baby in his cart. Even more confounding, after waiting for hours at the store, nobody comes forward to claim the baby. And to top everything off, theres a note on the baby which claims Joon-soo is the father! At first, Joon-Soo devises varies ways to abandon the child, but every time is spoiled by an unexpected event. When his teacher calls to warn him that he will be expelled if he misses another day, Joon-soo decides to bring the baby to school. This causes further scandal for Joon-Soo and eventually leads to his suspension. 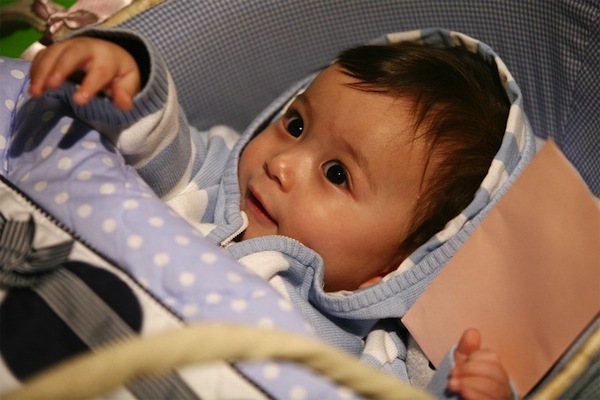 Through all this, Joon-Soo finds himself slowly becoming attached to the baby. Shalini Apr 29 2017 5:58 am Yesterday I watched the movie, it was so good. All the actors done their part perfectly. I loved the baby, Joon-Soo and Kim Byeol. I liked that class test scene and whenever Joon-Soo wave his hand on Kim Byeol's head. God it look so good. The baby was so cute. The three lead were the most beautiful people compare toh the remaining cast. And that last part when she kissed him even just for a second it was the best ending. Hope Nov 30 2016 10:42 am This movie is really good and i adore it,so funny and heart touching.Jang Geun Suk is really an amazing actor,i'm sad for him when others actors'fans write bad comments about him because aren't safe of their idols and are jealous and envy of his talent. Milly Mar 31 2016 7:55 pm JKS , I'm amused by u r acting , it's great . The story is really cute and sweet. wfspanda19 Jan 07 2015 6:59 pm I really want to know what song was playing during the airport scene! If anyone knows, please let me know! Rae Jun 11 2014 1:29 am i like this much... both the father and the kid were cute...awesome! but i like the teen father most.ahehheheh so cute and handsome..
Ree May 26 2014 8:27 pm Excellent movie. While for some reason I find most roles that JKS plays as annoying, this one was pleasantly refreshing. I also liked him in you're my pet and hong gil dong. Good acting, decent script (albeit seems reminiscent of the American movie Three men and a baby) and fast pace keeps you interested. I would strongly recommend watching this movie. melizarey May 09 2014 2:08 am ...love doesnt need any reason to be feel, it dorsnt belong to the blood but it belongs to every single nerve of your heart...love this story. jang geun suk was able to give justice to its role.. it really reaches my heart...two thumbs up for all the person behind this. M.G.J Apr 07 2012 12:08 pm where is go mi nam? SisterB Dec 07 2011 11:39 am This is a great movie! I never laughed so hard!! The baby mama search!! The breast milk search!! The actor talking as the baby!! Too funny!! I must buy this one! Susette Lazarte Jun 13 2011 4:42 am I really like you in Hwang Jini!!! Hope to see you someday. kim Apr 22 2011 10:06 am i luv the movie tooo much, and i luv jang geun-seok. grace Jan 13 2011 2:04 am this movie is really really great. i'm looking forward to meet Jang Geun Seok soon..
p Dec 31 2010 1:10 pm It wasn't best movie I ever seen but I enjoyed it. It was good. You were so cute. You are very nice actor. vanessa Jul 02 2010 12:59 am whats the name of the ending song i'm going crazy not know plz tell me!! especially the cast are Geun-seok Jang Kim Byeol Mason Mun. syasz Jul 21 2009 11:48 am i agree with @ Ki ..
the movie started off interestingly enough, but after 30 minutes or so, the plot started going downhill. Sure, the baby (and not to mention his dad) were cute and all that..well, honestly, i think this factor is the major attraction of the movie, not the movie itself. The plot is all over the place, and the message could be misinterpreted ; just because you're smart and all that, there is no reason to be disrespectful to your teachers, even sometimes showing off to the teachers that you're better than them by acting like a spoiled know-it-all. The characterisations are just..off. What is the whole point of the movie anyway? That it is okay to have babies while you're schooling as long as you're taking care of them? The character building is one thing, but the whole message is kinda narrowed down to only one scope, while disregarding other aspects of morale..and lunapark6 pointed out well enough some of the flaws of the movie..
pebz Nov 17 2008 4:02 am I'm not patient to watch Geun-Seok as a young-cute father . .
Ki Nov 11 2008 1:57 am “Baby & Me” seems like a can’t miss movie. The movie stars one of the most popular young actors in Korea today, Jang Geun-Suk, and features a story that revolves around a young teen suddenly thrust into fatherhood. At minimum, “Baby & Me” should elicit plenty of smiles and, possibly, a whole lot of laughs right? Sadly, it just ain’t so. Like a lot of Korean films these days, you’re treated to a decent first 30 minutes or so and than pure drudgery. With “Baby & Me” the laughs never come about, the storyline is fraught with illogical actions, and the movie makes a disappointing turn into pure drama territory towards the end of the film. Gun-seok Jang does his part to provide for a likable lead, but everything else about the movie is second-rate at best. One of the many misguided choices made by the filmmakers was to use an adult voice-over to illustrate the baby’s thoughts (ala 3 Men and a Baby). This came off as a cheap trick to make the movie cuter than necessary and never came close to being funny. Certain scenes also seemed seriously misguided. When Joon-soo smeared the baby’s soiled diapers on another student’s textbook (for complaining about the noise), it wreaked of poor taste and out of whack judgment on the main character’s part. There’s also many scenes with Kim Byeol telling off teachers in an intended cute manner, but came across as a self-centered brat. If all this isn’t bad enough, there’s plenty of moments with flawed logic. The biggest offense occurred during the movie’s climax. Jang Geun-Suk ran through the security checkpoint at the Incheon Airport to find a couple leaving the country. Eventually he did find the couple, while being chased by airport security. The problem? He had no idea which gate they were at! 2008 is turning out to be one of the weakest years for Korean films in terms of quality and commercial success. “Baby & Me” seems to follow this disappointing pattern by turning in another unsatisfactory effort. If you want a taste of a really good Korean comedy featuring a main character always running around with a baby strapped to their back than check out “Saving My Hubby.” “Baby & Me” is for only die-hard Jang Geun-Suk fans. P.S. For non-Koreans that watch “Baby & Me,” they may wonder to themselves where exactly Geon-seok Jang’s parents are staying at. If you’re one of them, the answer is “Jim Jil Bang” aka Korean sauna. There are plenty of Jim Jil Bangs in Korea and they cost around $20 bucks for a one day stay (you can sleep in there all night if you wish). VeE Aug 07 2008 6:50 am Huwaaaa!!! Jang Geun Seok iz so CUTE!!! Hope will be played in Indonesia!!!! Hoping much!! !